: Motel Morris is the second project of owners Brett Nidel, Sam Nidel, Tamara McCarthy and Matt Mogil, the team behind The Commons Chelsea. Here, they’ve tried to create a true neighborhood restaurant, the kind of spot where one can easily become a regular. Given the place’s vintage photographs, cheeky pink bathrooms, chic but laid back vibe and accessible, seasonal menu, they have succeeded. Chef Bill McDaniel’s appetizers include tender charred octopus with sweet Chinese sausage and a decadent take on potato pierogies, filled with juicy lobster, scallions and shiitakes. As for entrées, everything bagel-crusted tuna served with buttered basmati rice and grilled skirt steak with Gruyère fondue are creative and satisfying takes on bistro staples. 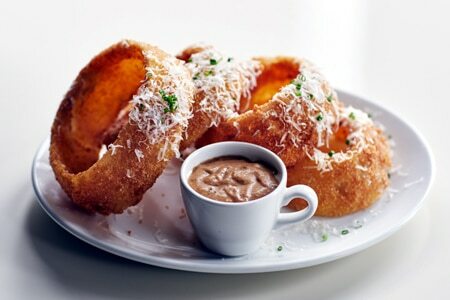 Gigantic Parmesan-crusted onion rings are perfect for sharing with a (hungry) table. Sip a local craft beer or a classic cocktail with a twist, or try a glass or bottle of wine from a well-curated, thoughtful list. For a happy ending, choose the rich butterscotch banana pudding pie topped with butter brittle and a mountain of whipped cream.